This simple but elegant beauty has 4mm freshwater pearls and brass spacer beads. Two spirals of the bronze wire complete the embellishments. It is worn in the middle of the ear with the bead pointing either up or down depending on which ear you wear it. 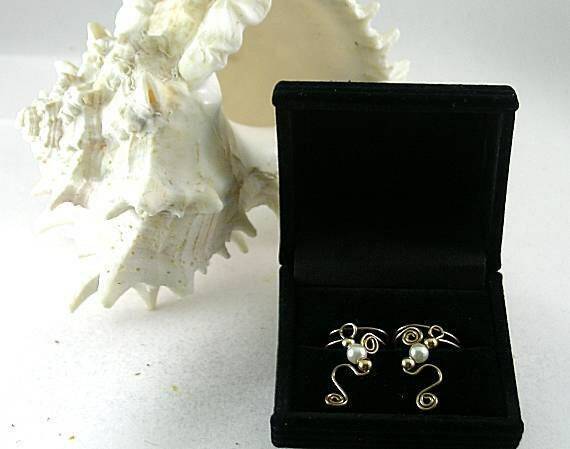 Or, be creative and wear both on one ear with the pearls pointing in both directions. Note: Bronze Ear Cuffs! The ear cuffs on the model are not in this listing. 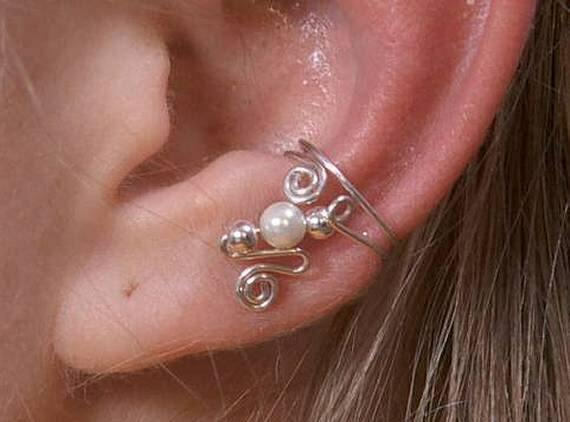 They represent how the ear cuffs are worn and are for display only. Bronze/Brass Jewelry Wire - Sold as pairs. We ship via USPS Priority Mail - Insured for safety and so that you can track your package on-line. Other stones are available for custom orders, such as coral and obsidian as well as Swarovski crystals. PEARLS have long been associated with love, all oceanic deities like Neptune and Poseidon but specifically goddess- oriented; also associated with sky goddesses and the Egyptian goddess Isis. Other goddess with pearl connections are Aphrodite, Freya, Venus, Lakshmi, Diana and, of course, the Mother Goddess.